The seaward defense craft HAVFRUEN. 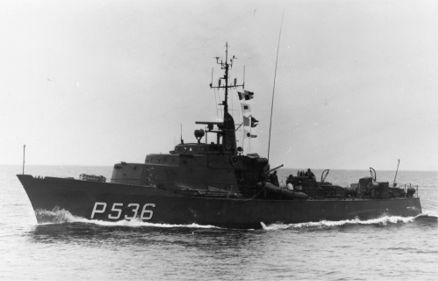 The ships were constructed on the basis of the British FORD Class patrol vessels. Originally painted in olive green like the Fast Patrol Boats, but during 1980-1984 all the ships were painted in the standard navy grey. The first eight ships were built under the joined Danish-American Cost Sharing Programme, which meant that DAPHNE, HAVMANDEN, NAJADEN and NEPTUN were paid for by the USA, the rest by Denmark. The last, and ninth ship, was built as a sole Danish project. 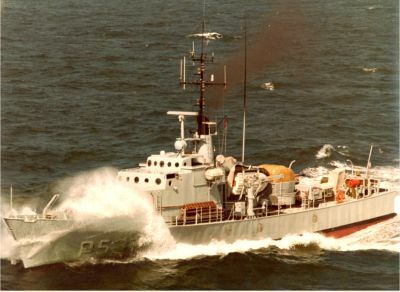 The seaward defense craft NEPTUN. 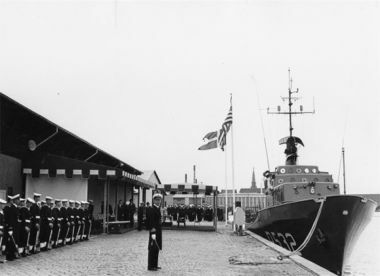 The seaward defense craft HAVMANDEN during hand over and commissioning on August 30, 1962. 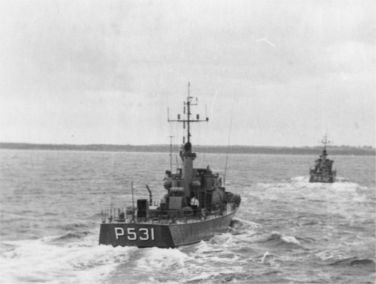 The seaward defense crafts DRYADEN (right) and HAVMANDEN.